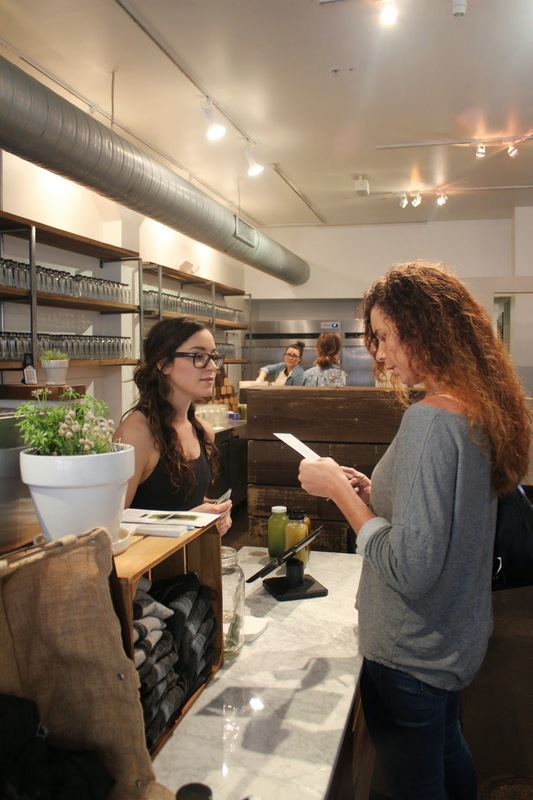 There is now a place here in Columbus where you can get 100% raw, organic juices! 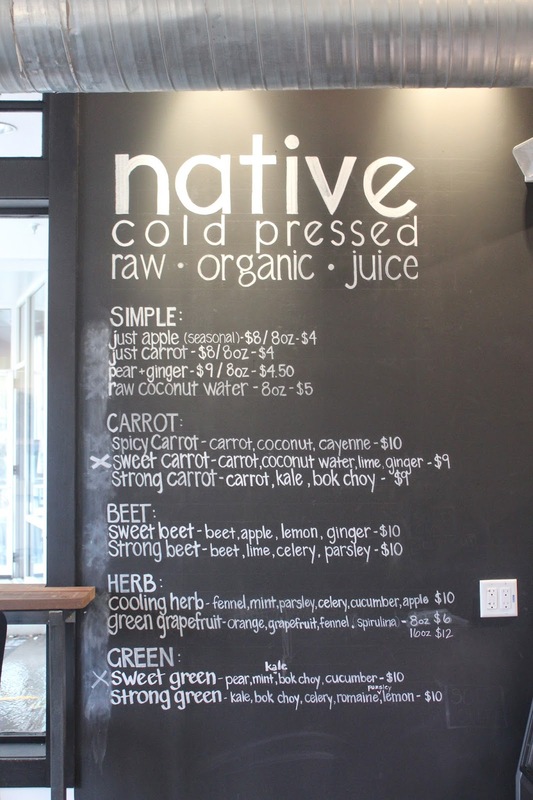 Enter Native Cold Pressed, which is located down on North High Street. What's it all about you ask?! Well, they use locally sourced ingredients to create you a delicious raw juice that is always served in a glass bottle. Each bottle consists of roughly 3 pounds of produce and is loaded with nutrients! The owners, Nicole and Erin, can even help you pick out a cleanse if you're interested in more than just one juice. They have beginner cleanses for those who are newer to the juicing lifestyle and also more experienced cleanses. You can even create a custom cleanse, too. 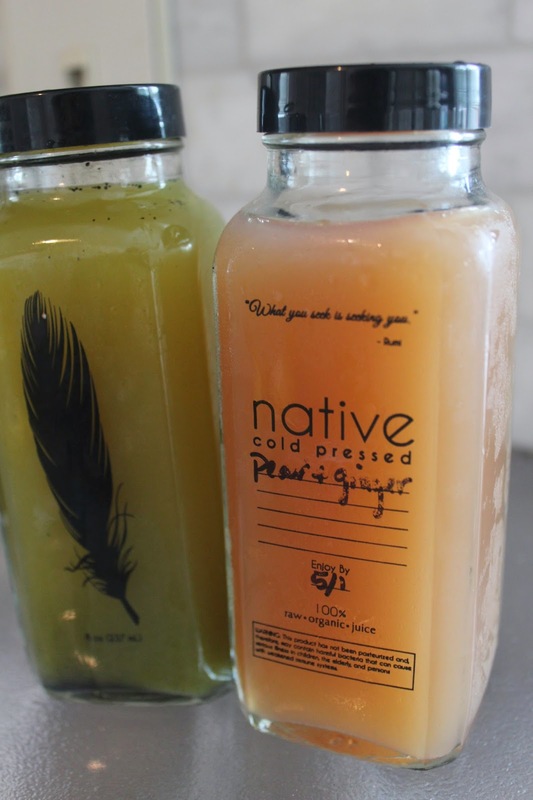 I just recently tried the green grapefruit + the pear ginger juices (you can see the menu here) and loved them. The pear + ginger was very mild so if you don't like a drink that is too bold, this would be a good one for you to try. I liked the green grapefruit the best though out of the two because of all the yummy vegetables in it! I drank them for breakfast and felt like I could take on the world the rest of the day... ;) It's safe to say I will be a frequent visitor of Native because let's be honest, sometimes you don't want to get that mess at home, or maybe you don't have all the produce you need on hand, and you just want to pick one up that's already prepared and ready to drink. That's how I am sometimes, at least! Do you have a raw juice company in your city? If you haven't looked, it wouldn't hurt to search for one! Wow that looks like the coolest place!! I have never heard of a place like that down here in Dallas but I haven't looked very far ;) I would totally try a cleaning juice! I love fresh juice. The adorable packaging makes it that much sweeter! seriously another reason I MUST visit columbus :) one of best friends is a Ohio State alum, and everything he says about columbus makes me want to visit so badly. adding this place to my "must visit in Columbus" list! thanks lady! polished UK Replica watches steel mesh metal bracelet. That would have helped the value proposition of the Designer handbags a bit more. Rubber is nice and all, but in terms of presentation, you just can’t beat a nice solid metal bracelet. handbag replica It is difficult to predict where Breitling will take their Chronoworks products in Watches Replica the future. They certainly need to share the story a lot better and explain where the source of Replica Rolex Watches value is.